Yandex is the biggest russian search engine with loads of options similar to Google. Its use raised for SEO people because they allow their metrics [kind of PageRank] to be used while Google killed its own PR. Here is an SEO guide about using Yandex. In addition to using the query language operators, search engine Yandex is possible to control the issuance of the baseline demand (in the URL issuing it corresponds to the value of the parameter text) through a variety of get-format variable = value parameters used in the URL of the page of issue. So we can just change parts of Yandex URL like we do with Google to get searches done. The basic set of these parameters can be determined by using the advanced search filters, and custom search settings. You have to click this symbol from photo to get advanced things. Then you can do searches like: choose filetype, choose language, choose time of results and more. • lr (issuance of the region) – is used as the value of the region’s number. The numerical values ? ?of numbers of some common areas can be found on page https://yandex.ru/yaca/geo.c2n, but the base is much used complete (it according to various estimates, obtained by sorting the values ? ?contained tens of thousands of the regions). This parameter has no analogue in the query language. 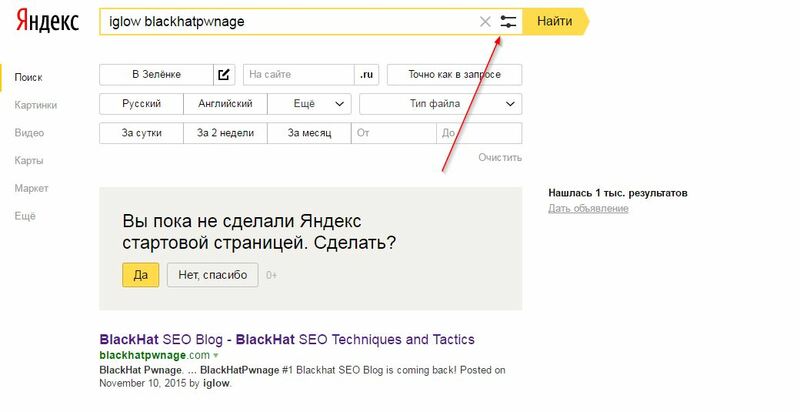 Advanced search filters are activated by pressing the corresponding button on the search form: https://yandex.ru/support/search/how-to-search/advanced-search.xml. Also, a separate form of the advanced search Yandex in a slightly different format, located at https://www.yandex.ru/search/advanced, but it is possible that she was not a documented search capabilities and is-forgotten artifact. With the help of advanced search is possible to identify a number of parameters of the URL of issuance. Some of them are essentially duplicate the corresponding query language statements, and some in the query language are unique. Note that I is more preferable for issuing a study where it is possible to apply exactly get-parameters, not query language statements. Since in this case the base itself formally request remains unchanged, which provides, in my opinion, greater purity of the study. • rstr (search sites in a given region) – is used as the value of the region’s number is similar to the operator lr with one difference that region before the number you need to put the “minus” sign, for example: rstr = -15. Unfortunately, in fact, to grant the use of this option does not contain the documents linked to a specific region, and documents that contain text or anchor file references a given region, ie, in fact there is a modification of the basic query by adding the name of the region. • mime (document format) – takes the values ? ?html, pdf, rtf, doc, swf, xls, ppt, docx, odt, odp, ods, odg, xlsx, pptx. • numdoc (issue number of results on the page) – takes the values ? ?10, 20, 30 and 50. When using numbers different from those values ? ?less than 50, there is a round up to the nearest one. If you use numbers more than 50, there is a rounding to 50. At the end it should probably be noted that there is another option, an artifact that in some way changes the search results for the basic search. This option hodreq, the value of which is a certain search query. Once this option is used in the “Search within results”, fixing the previous search query, which limited selection of documents for applying the basic request. However, at the moment correctly interpret the effect of this parameter, I, unfortunately, did not succeed. This entry was posted in Protected Posts, Research Software, SERP Tracking and tagged how to use yandex, russian seo, yandex guide, yandex tutorial, yandex.ru by iglow. Bookmark the permalink.